Sing to Life: We're back! Montana, Part 1. We're back! Montana, Part 1. Yes, we've been back for some time now. I'm sorry I haven't posted yet! It was a long trip, and it was a great trip, and yes, I made it through! Here's the first part of the trip, with more to come soon. I promise! We left Friday evening and our flight totaled about seven hours, bringing us in around midnight CMT. I knew we wouldn't be landing and heading off to a nice warm bed to snuggle, though - getting sleep on the plane was going to be our only chance for rest before hunting began! Sure enough, once we grabbed our luggage off the belt and picked up our rental car, we headed to the 24-hour Walmart in Great Falls to buy a trip's worth of food and supplies. Brian had his grocery list made up well in advance, and we filled our cart with bottled water, jerky, nuts, fruit, energy bars, candy, sausage, cheese, wipes, paper towels, garbage bags, propane, toothpaste, ibuprofen, caffeine pills, foot powder, and more. We loaded the heaping cart into the car at about 1:30 AM and headed off to our hunting spot - about three and a half hours away. Thankfully, Brian did all the driving and I slept on the way (thank goodness, because I cannot sleep on a plane to save my life!). When I felt the car bouncing and rolling over a rough two-track road, I knew we were there. Our hunt was beginning! Still, I prayed, "Please, Lord, make Brian get some sleep first. I don't want to wake up and go hiking just yet." Thankfully, Brian napped for about 40 minutes; then, when it was still dark and cold, he told me to get dressed. That morning, we decided not to pack out our tent and gear. Instead, since it was a short hike, we decided to check out Spot 1 for a half-day hunt instead. As we walked, I heard a coyote bark close by in the darkness. At first I thought, "This isn't secluded - someone's dumb dog is barking at us." Then Brian whispered, "Hear that 'yote?" And I said, "Yes, that coyote, of course." After about a half-mile hike we came to a ledge overlooking a large valley. It was beginning to lighten as I watched Brian set an arrow and bugle loudly. In the misty, dim morning light, his call carried over the silent river. We waited for sound or movement for some time, but there was nothing. Moving on, he repeated the bugle and waited. Nothing. Next spot, nothing. It was a pretty chilly morning and already I couldn't help but think, "Why in the world did I come?" My feet were numb and my hands were freezing despite my gloves and I couldn't stop my nose from running (and I couldn't sniff because we had to keep quiet). Then I stopped myself. I determined that I would not start the trip out dwelling on the negative! I started thinking, "Thank goodness my hands and feet aren't getting too warm. Thank goodness I'm not all stuffed up." It worked! Ah, the power of positive thought, am I right? When the sun began to slowly.... slowly... warm up the air... I was able to really enjoy the hike. We found some wild raspberries that were slushy from the frost. They were great. Some fuzzy green moss - it was on everything. Moss- (or mold?) speckled boulders. 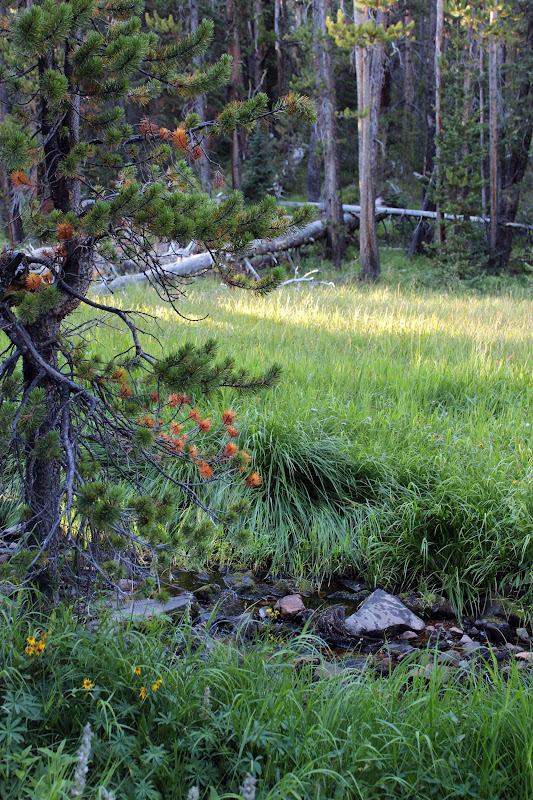 Such a wide-open valley, with food sources and water- a perfect spot... but no elk. My spiffy boots gave me blisters at first, but at least they kept my feet dry when we crossed streams. Unfortunately, we didn't see or hear any elk. 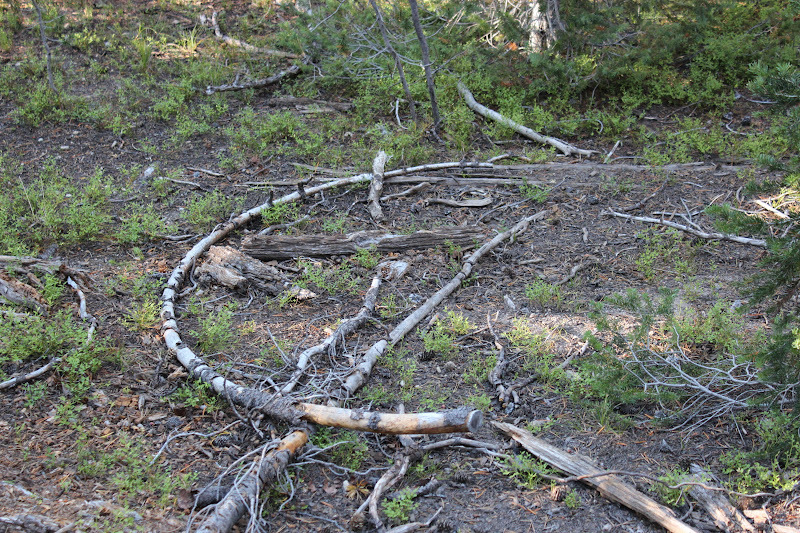 At the end of the walk we sat down on a forested area, off the trail, and spotted tracks. But Brian explained that when pressured, elk will move to another area, in contrast to whitetail deer who will stay put when pressured but go nocturnal. He decided that Spot 1 wasn't worth our stay. We hiked back to the car and began the 30 minute drive to Spot 2. We reached Spot 2 around noon and were immensely disappointed to see that Labor Day weekend had brought hordes of RVs and visitors to the trailhead. Even worse, we discovered that our promising Spot 2 was an ATV trail. As we sat there in the car, baffled about whether or not we should make the long hike up anyway, we witnessed thirty or so hunters whizzing back and forth on their four-wheelers, bows on their backs, yelling loudly to each other. "Bummer," Brian said over and over. 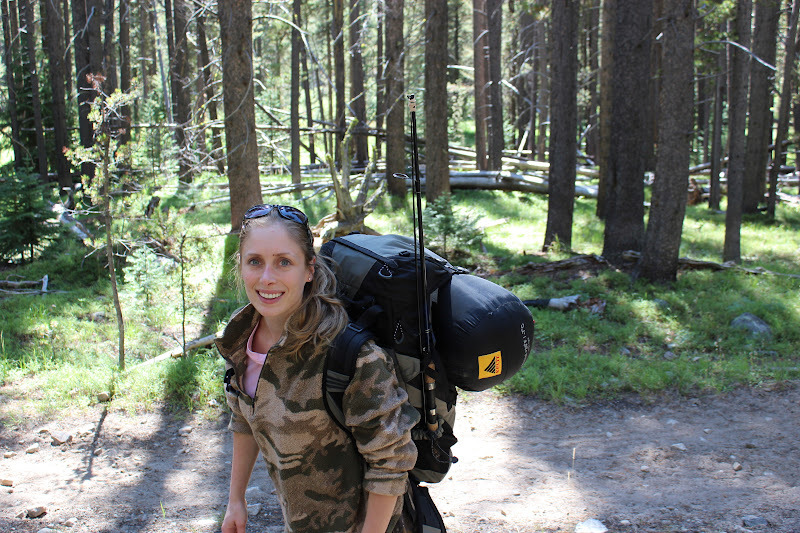 "I don't want to waste our time hiking all the way up there when we've got people making tons of noise, zooming past us and scaring all the elk away." He sat with his hands on the wheel and his eyebrows furrowed together. Eventually he concluded that Spot 2 was no longer promising and that it wouldn't even be worth a try. On to Spot 3 it was! We were still disappointed to see several campers on the way to the Spot 3 trailhead, but since this spot was closed to ATVs we knew we could get away from civilization by - as Brian would say - "putting some miles on our boots." Well, let me tell you what - that's exactly what we did. 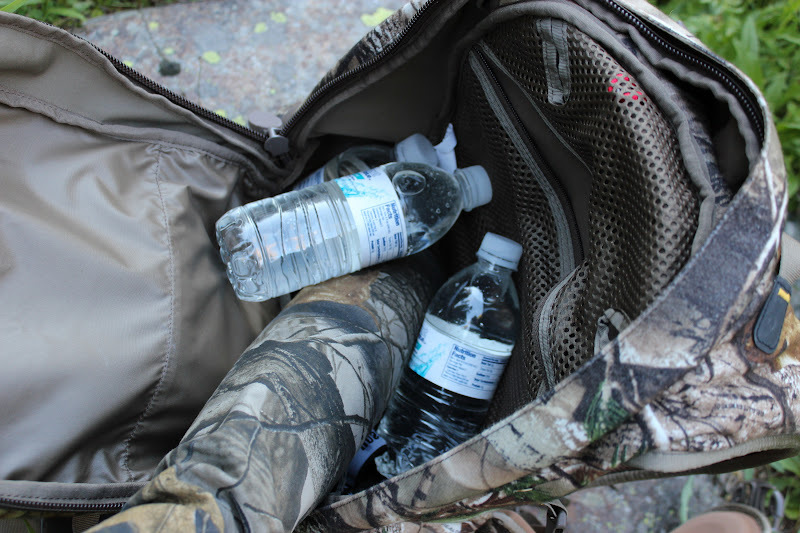 We made lunch, then packed our gear onto our backs and headed up the trail. We were hoping to get to what looked like a wide clearing on Brian's topographical map. We thought it'd be perfect for spotting elk from the trees. Brian prepping water for our lunches. Our freeze-dried Mountain House meals rehydrating... mmm. They were surprisingly good. Not a great picture, but we were having a good time despite the setbacks. Brian, all ready to go. His pack was pretty heavy and bulky. The trail, at least, was well-defined and easy to walk (though it was uphill). 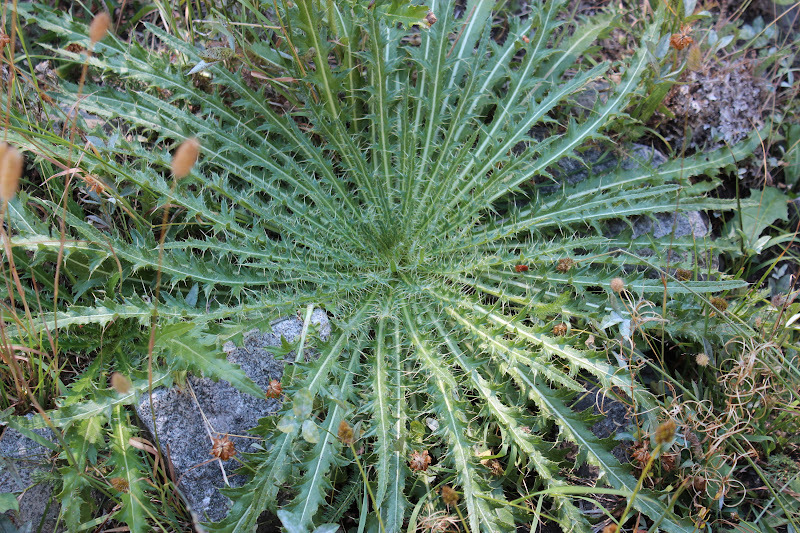 A perfect thistle that I spotted. 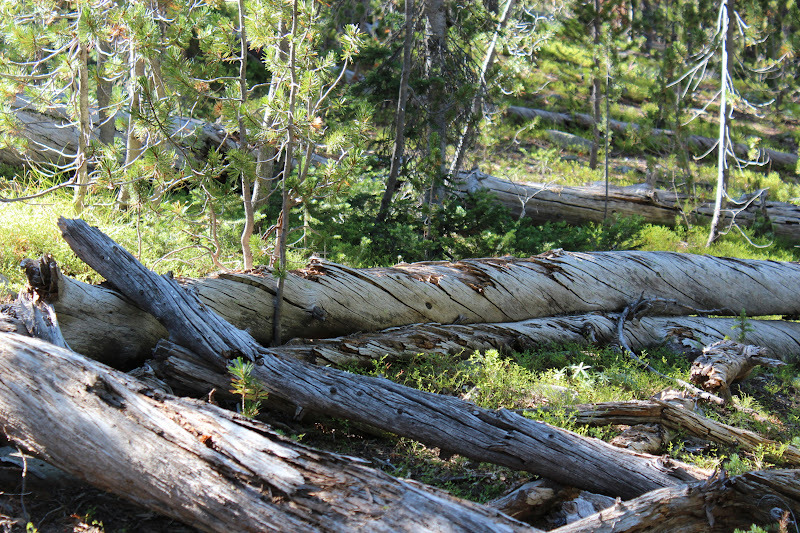 There were lots of fallen trees along the path, and they were all twisty from the wind. That trail was about 3.5 miles and uphill all the way. As we walked, I began to realize that I was developing blisters on my feet. OH, NO. I knew we were in for a ton of hiking over the next week, and the last thing I needed was pain from my boots. When we got to the clearing we realized that it was much smaller than it looked on the map, and that it wouldn't be suitable. Brian decided we needed to keep going. 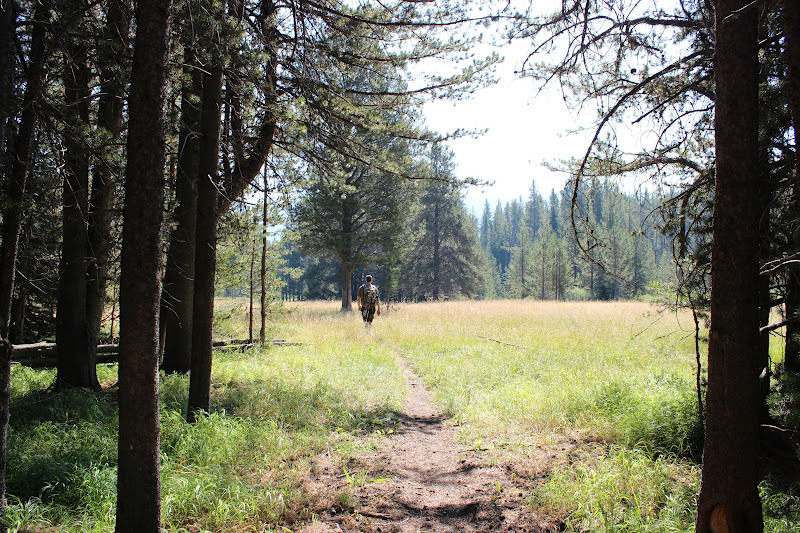 We were almost to the next, larger clearing, when it seemed that we'd been walking an awfully long time... too long. 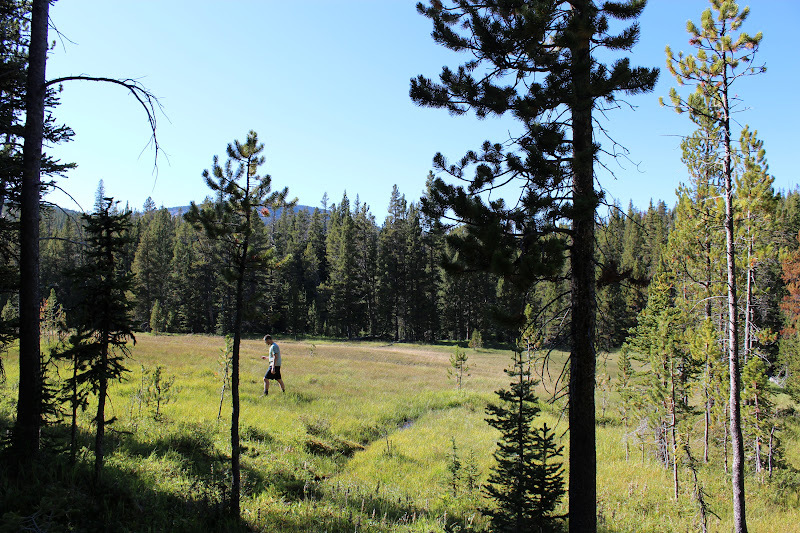 Brian began to wonder if we'd gotten off on the wrong trail when we'd made a bit of a detour to explore the first meadow. Not knowing where we were, exactly, and having my feet feel as though they were on fire, we were both tired and anxious and hot. I paused on the trail and switched my boots out for my flip-flops. Though my feel got really dirty, really fast, they were able to breathe a bit. Ahhh! 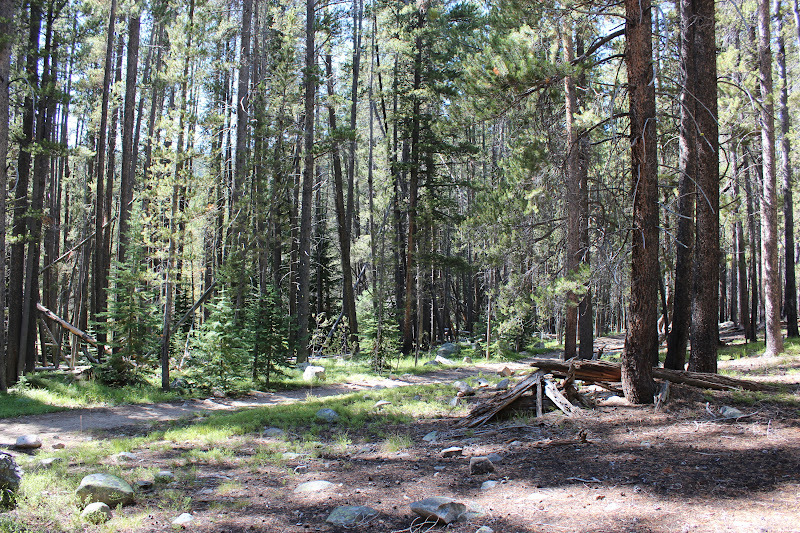 We came to the larger clearing, which also didn't look the way it appeared on the map, and decided to camp there. We thought we were in the right place, but Brian was second-guessing himself all night long. Brian, trying to figure out our location. 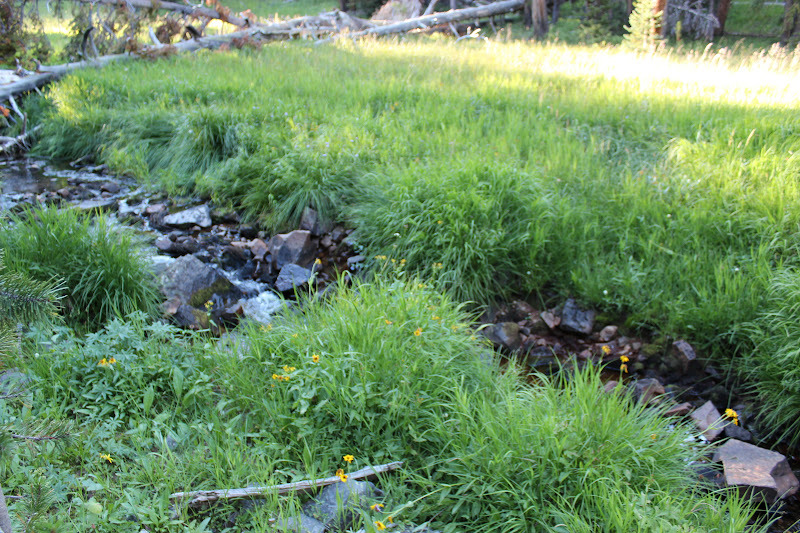 That night we hiked to the stream to filter a few bottles of water. Along the way, Brian made a few location bugles to try to get a response. Meanwhile, I was snapping away at objects that struck my fancy. 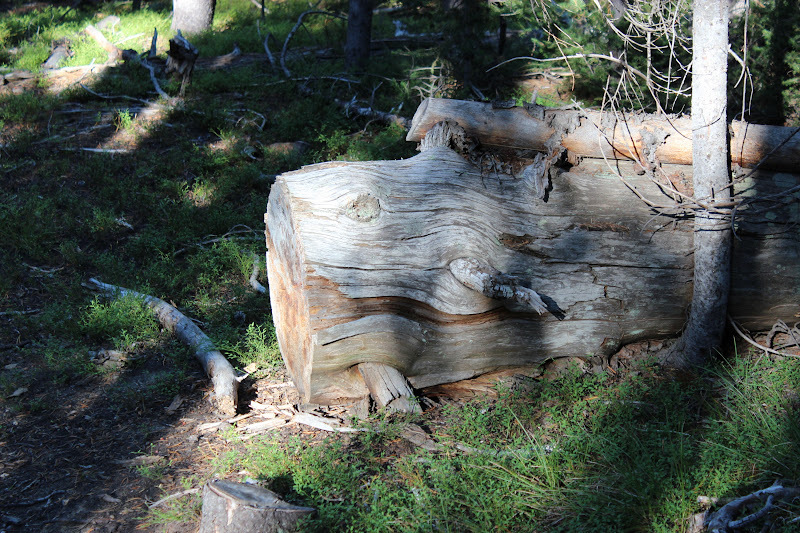 ...or a fallen trunk that looked like a monster fish! The stream was very chilly. Brian rinsed off with a washcloth, but there was no way I was going to do that. I was content to give myself a baby-wipes "bath" at the tent, and stay warm. The water that we filtered tasted great. The next morning dawned chilly and rather disappointing, as we'd heard not a single elk call. We dressed for hunting and I pulled my boots on. My feet were already in misery and I thought, What in the world am I going to do about these blisters? Hunt in flip-flops all week?! We hiked a mile or so and glassed a few spots. Brian made a couple of elk calls, but there was no reply. 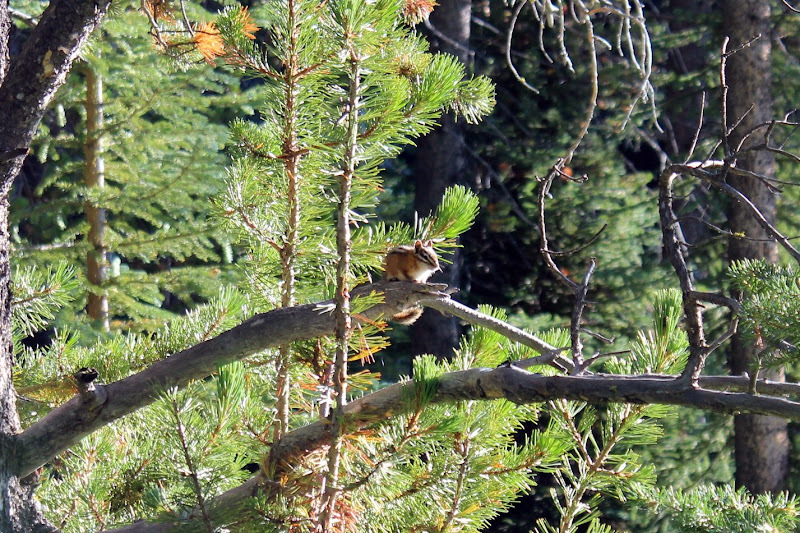 We did spot this cute little guy. Brian trudging through a frosty meadow. Several minutes later we saw another hunter walking toward us through the trees. Immediately I had a bad attitude, thinking, There aren't any elk here for us, and we have to share this spot with someone else? Oh, Maegan. 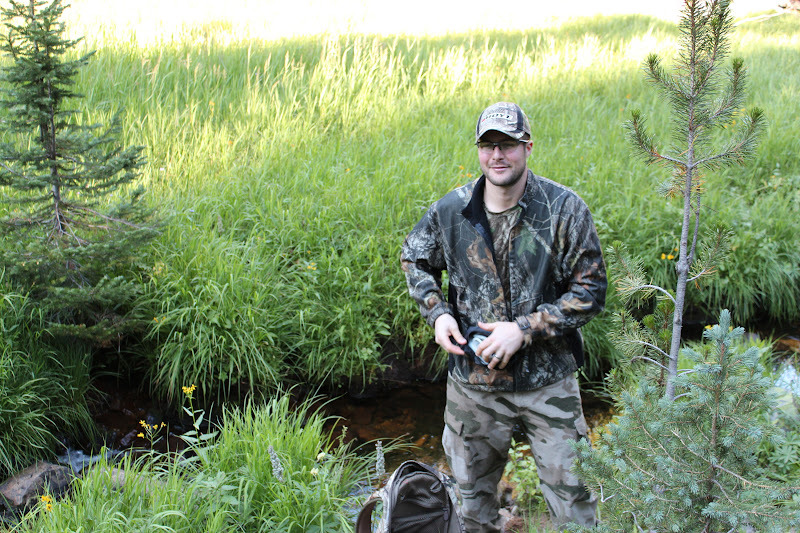 The hunter introduced himself to us and he and Brian set to talking about spots, elk hunting tips, and strategy. He turned out to be a Montana resident who had hiked up for the weekend just to see what he could see. He explained that the spot we were hunting used to be amazingly good, but that the wolves had decimated the population over the past eight years. He said that the elk were so wary now they wouldn't come out before nightfall and they weren't making any noise at all. 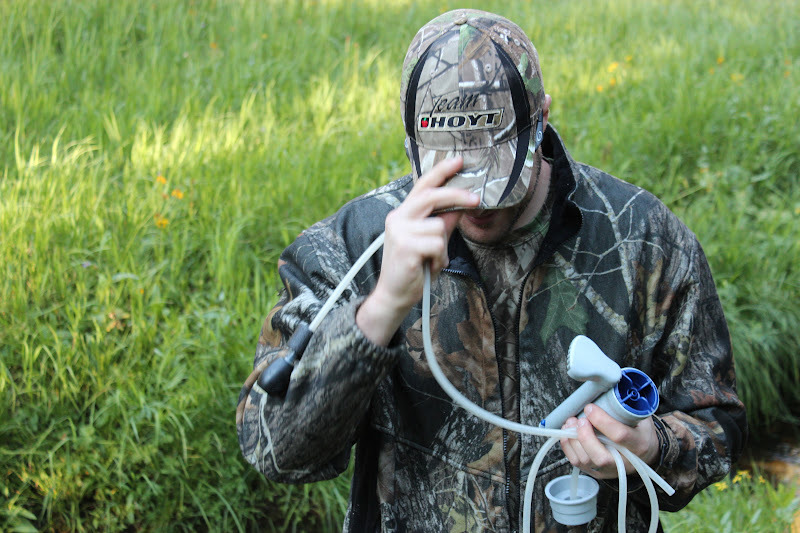 He added that the movement would be better during the rut... but there was the problem. 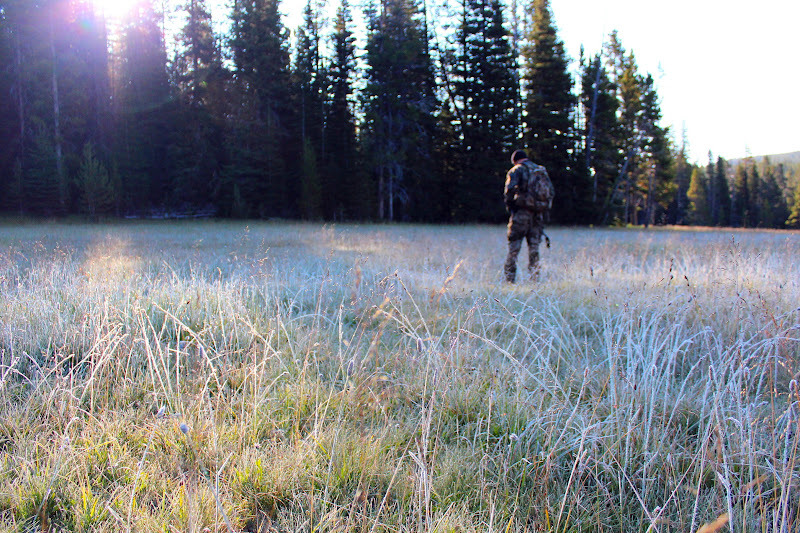 We'd come too early for the rut. It wasn't supposed to be starting for at least another week. I was also excited about giving my poor feet a chance to cool down and heal up. We tromped down the mountain and headed for our friends' house, five hours away. We called our friends to let them know we were already on our way - we certainly caught them off guard, as they hadn't expected us so soon - but they were extremely gracious and excited to see us. 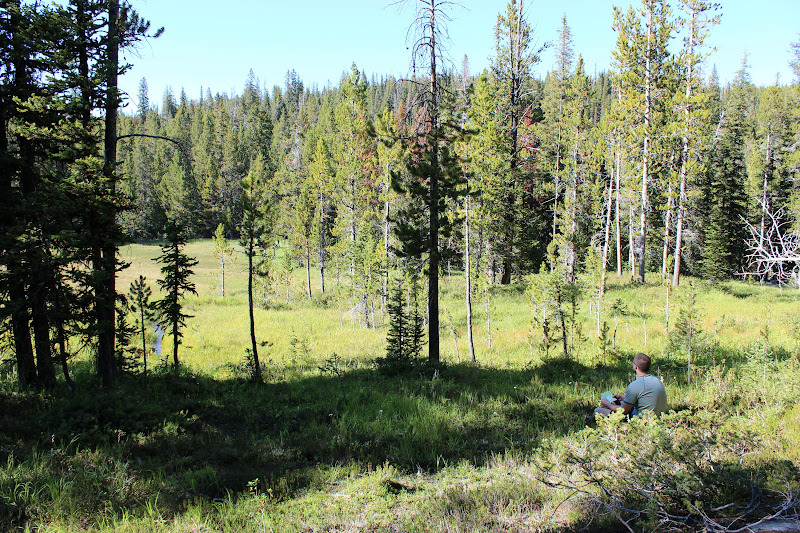 In high spirits, we left Beaverhead National Forest to relax for a few days and let the elk get more comfortable. 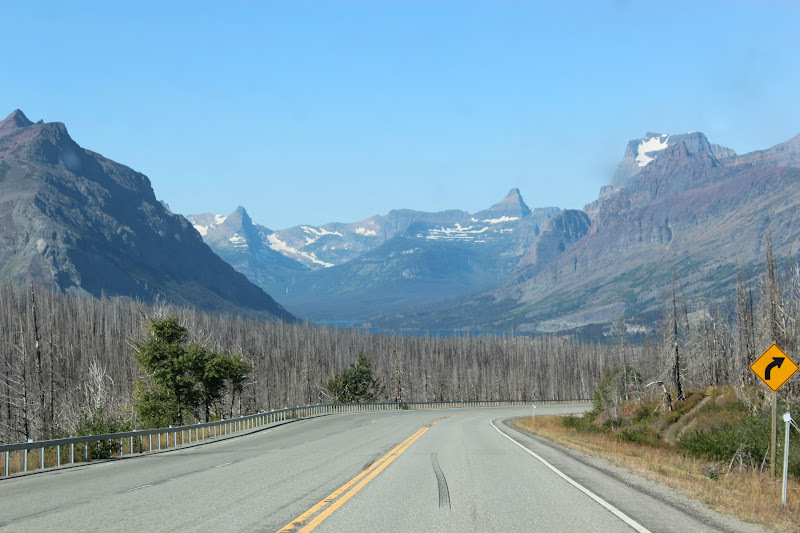 We were going to see our friends, and Glacier National Park, and maybe... a giant mulie buck! The drive was lovely. 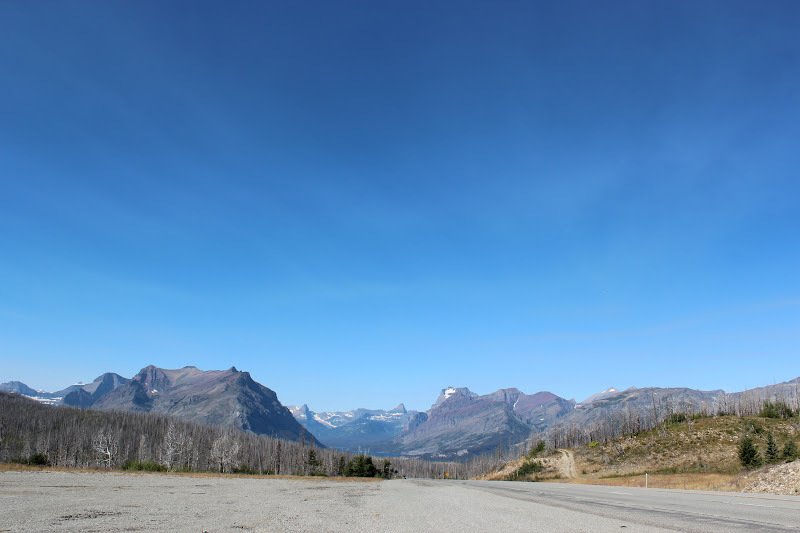 I thought, could Glacier Nat'l Park be any better than this? So much fun! Welcome back! You guys are really cute as wilderness explorers :-) I love the pictures, can't wait to see more!